Timelessly beautiful, this sparkling 9ct white gold diamond ring showcases an illusion set diamond in the centre, with a halo of diamonds crafted around the band and diamond set shoulders. 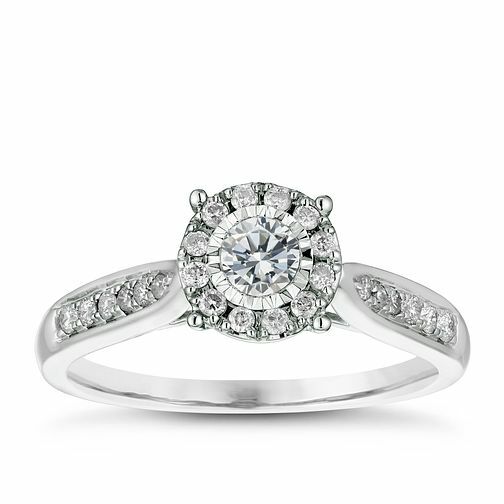 A striking 0.33 carat ring that will make the ideal diamond engagement ring for that special someone in your life. 9ct White Gold 1/3ct Diamond Illusion Set Cluster Ring is rated 5.0 out of 5 by 1. Rated 5 out of 5 by Anonymous from Amazing This ring even though it is a Halo ring, it blends into one. It glitters in all light, I was lucky enough to be served by the Manager in the Stevenage branch. A honest chap, with good advice. Anyone local looking to proprose to their one. Get down there. He will point you where to go. Matt your the man!! !